The Spring Bay Community Boat Shed will be relocating to The Village at Triabunna by the 30th of November. Currently we are in transition mode, working through the process of adapting to a smaller space and seeking storage for items which will not fit into our new profile. Moving to The Village will provide major benefits such as greatly improved public access and catering facilities. Our boat restoration and maintenance work will continue as we aim to improve our interpretation and display presentation. 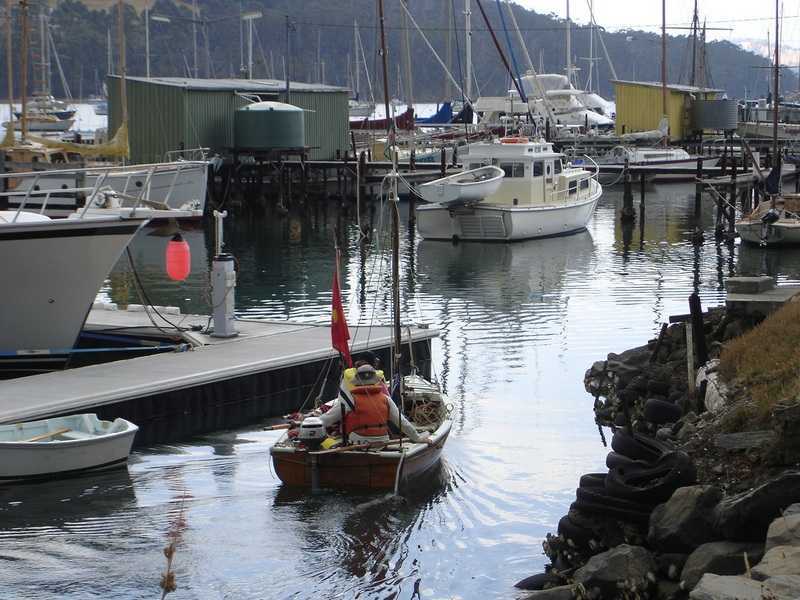 Our Boat Shed activities are conducted in a spirit of informed cooperation, resulting in a satisfying operation overall. Members are free to select their involvement in accord with their personal interests and time availability. Our new space will encourage more activity. Along with workshop functions Monday’s Organizational Day has consistently provided a midday meal which is enjoyed by those present as a valued social time for the group. This meal is an important fundraiser which, along with various raffles, has kept The Boat Shed financially stable. We are already using The Village Barn for our Monday meals. 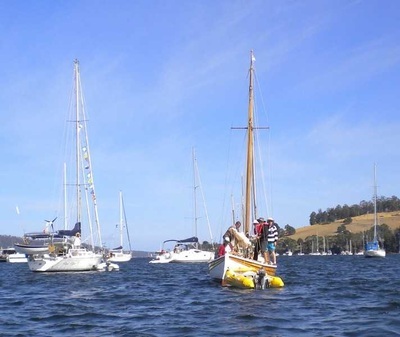 Members have enjoyed On Water Activities using our own vessels and sharing events with partner organizations such as The Living Boat Trust of Franklin and The Wooden Boat Guild of Tasmania. The OWA Programme will be expanded after our move. The past twelve months has seen the growing recognition of The SBCBS as a worthwhile, supportive and sustainable group within the community. We have received a Tidy Towns award for community relevance and seen real expansion in our membership. Stability in finances has completed a pleasing management package. We look forward with great enthusiasm to our new circumstances and opportunities. 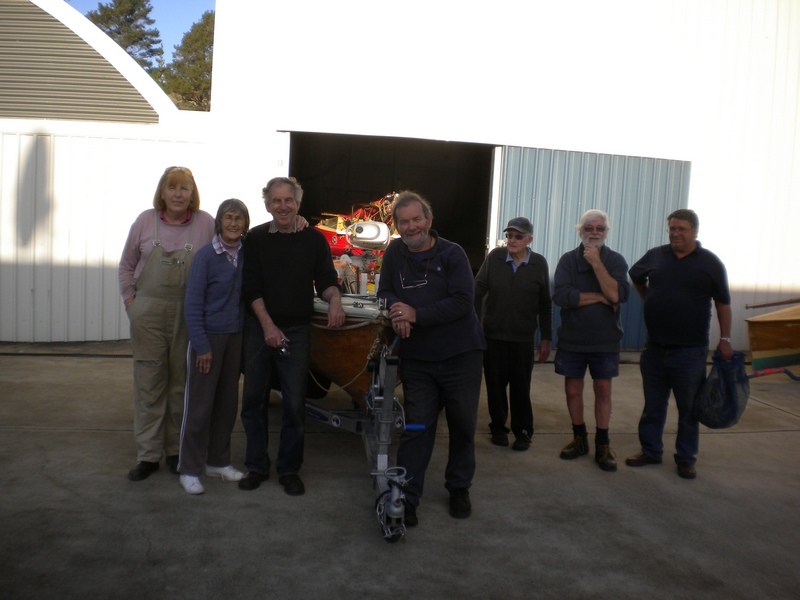 The Spring Bay Community Boat Shed July 2015. This milestone gathering included meeting and greeting, shed tours and a small but significant ceremony before the very enjoyable light lunch. Our Shed is now building on a growing awareness of its activities and potential as a special place to be. Thanks to all those who were able to join us. 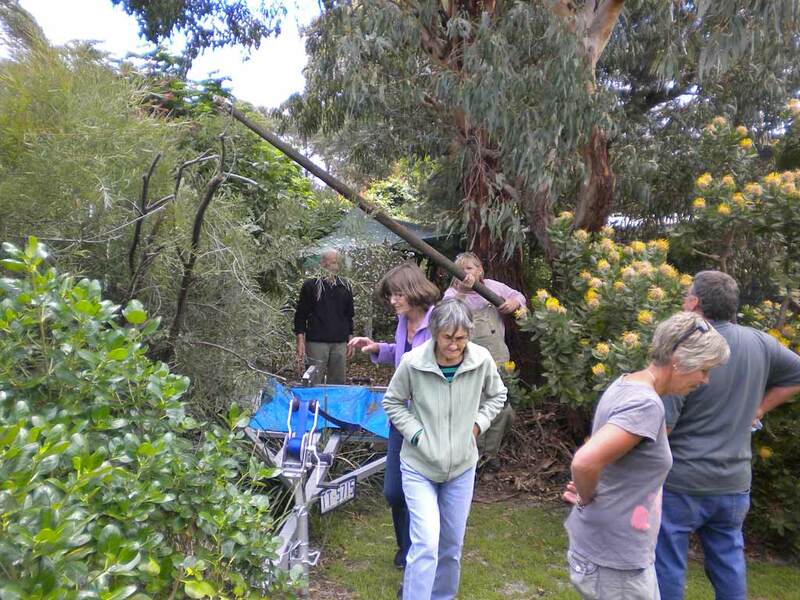 Recent visitors have included politicians, a great Prosser House bus touring group and Tidy Towns officials. 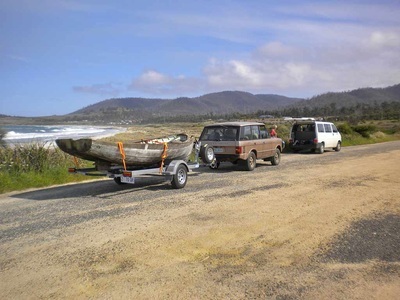 Since relocating we have been very fortunate in receiving the donations of three dinghies which have greatly expanded the activity potential of our fleet. 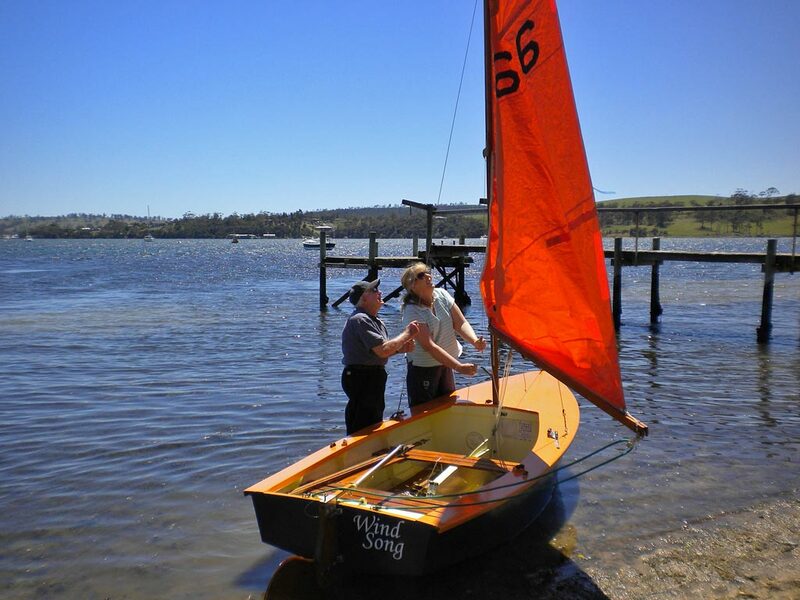 Many thanks to Fay and Peter Ibbott and Ian Bresnehan for their family dinghies, also to Keith Breheny for his classic Tamar sailing dinghy. You are invited to join in and explore communal activities and projects or simply enjoy a cup of tea or coffee and a chat. Monday 10.30 a.m. – 3.30 p.m. is still the meeting, planning and working time, with lunch available for the cost of a donation. Call David on 0400 432 331 if you would like to visit us after Monday. Other opening days are decided by arrangement. You’re always very welcome. 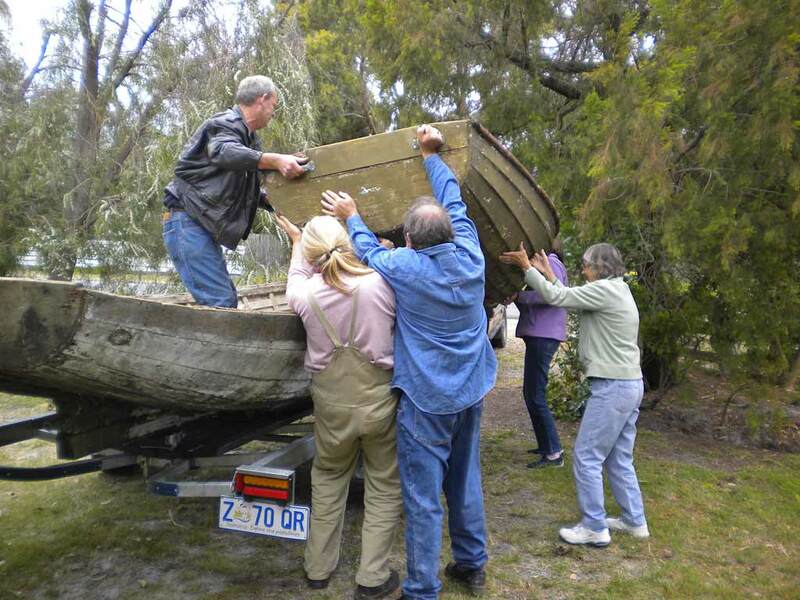 The Spring Bay Community Boat Shed is now in action at 1 Bull Lane, Triabunna. Adapting to our new home is in full swing. Thanks to Ian and Janice Weeding we are now established in a great facility, solely dedicated to our own operations. We have a range of spaces to use in the old factory from which we have created a lounge and display area, workshops and store rooms. The display space is large enough to enable an important sample of our boats to be displayed fully rigged. This is a real bonus for how we present our fleet and tell the story of our shed. Members are now able to spread out a little in the main workshop which can house most of our project boats. Our group is very enthusiastic about the possibilities which these new arrangements are offering. The building will be a great base for the future of the Boat Shed. 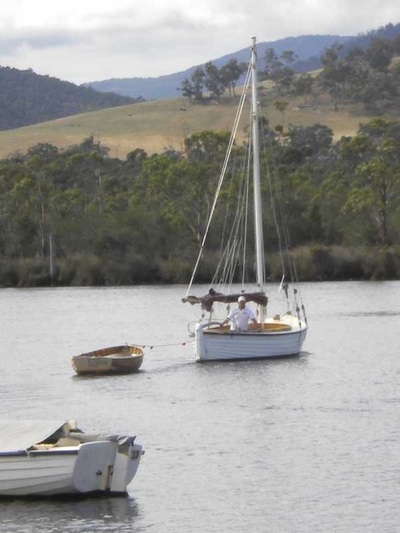 We are looking forward to exciting times leading up to the Australian Wooden Boat Festival in February 2015, including projects both on and off the water. 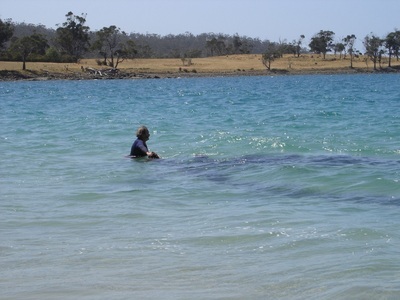 Call David on 0400 432 331 if you would like to visit us. Other opening days are decided by arrangement. You are invited to join in and explore communal activities and projects or simply enjoy a cup of tea or coffee and a chat. At the moment, please take us as you find us….but you’re always very welcome. 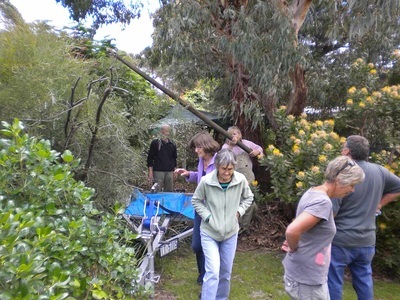 It was great to be able to combine a working visit to The Living Boat Trust with the Focus on Franklin celebration. Bargains from the Boat and Car Boot Sale added to very welcome advice and information in support of our Spring Bay Community Boat Shed programme. 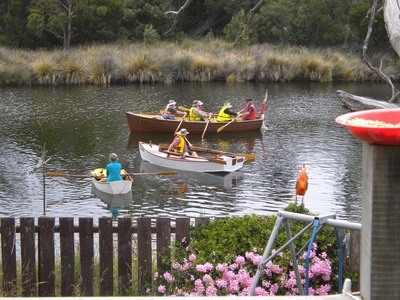 During the day we were keen spectators at the St Ayle’s Skiff Regatta in which many enthusiastic teams rowed their four-oared skiffs on the Franklin Rowing Club course. Hot competition was the order of the day with excellent performances from all involved. The Franklin waterfront was busy with river traffic, moored vessels and those alongside the jetties. A varied fleet of vessels was on show, with the wonderful ‘Yukon’ taking pride of place, complete with her spectacular square sail yard. Time did not permit joining the afternoon cruise offered by ‘Yukon’ but that is certainly on our wish list for next time. Being an active and involved part of the small wooden boat community is an important motivation for participating in events which include such vessels. Development of skills and extending experience is another important aspect. 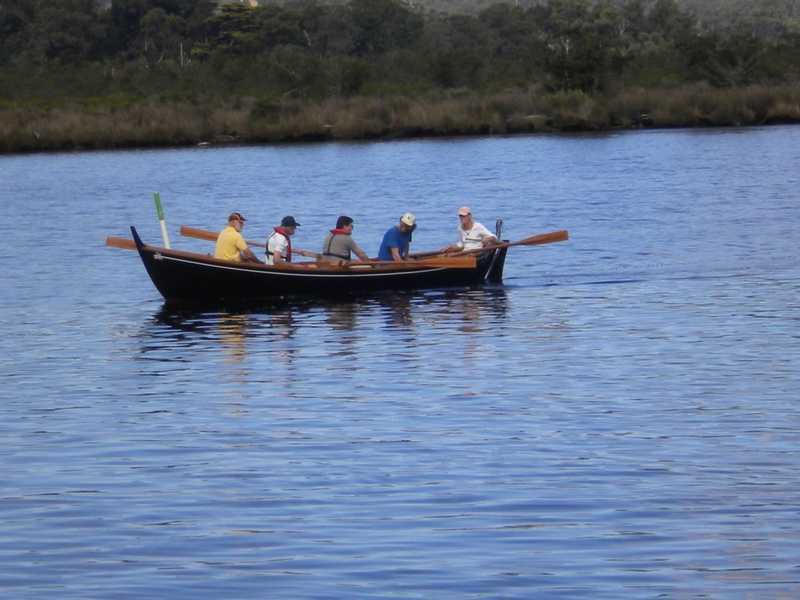 At present we operate ‘Touch Wood’ as our on-water boat and we aspire to extend our view beyond Spring Bay to join with ‘those of like mind’ in the enjoyment of being on the water. These same folk have visited us and will return in the future to share our common bond, hospitality and waterways. 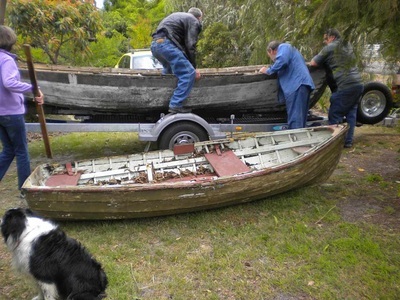 The Kettering Adventure was much in mind as preparations for Cygnet began. Upon arriving at Cygnet the excitement of celebrating 150 years of their regatta was clearly seen in the large number of people around the Yacht Club and the growing number of boats arriving. We ventured onto Port Cygnet and made our way to the eastern side to practise runs with both square and lugsails in a steady southerly wind. In the distance was the beautiful sight of the Wooden Boat Guild’s restored historic yacht ‘Terra Linna’. She was under sail and working down the bay. Getting to closer quarters made for a very enjoyable cruise, made only more so by the sight of the large number of keel boats approaching in their voyage to the regatta from Kettering. 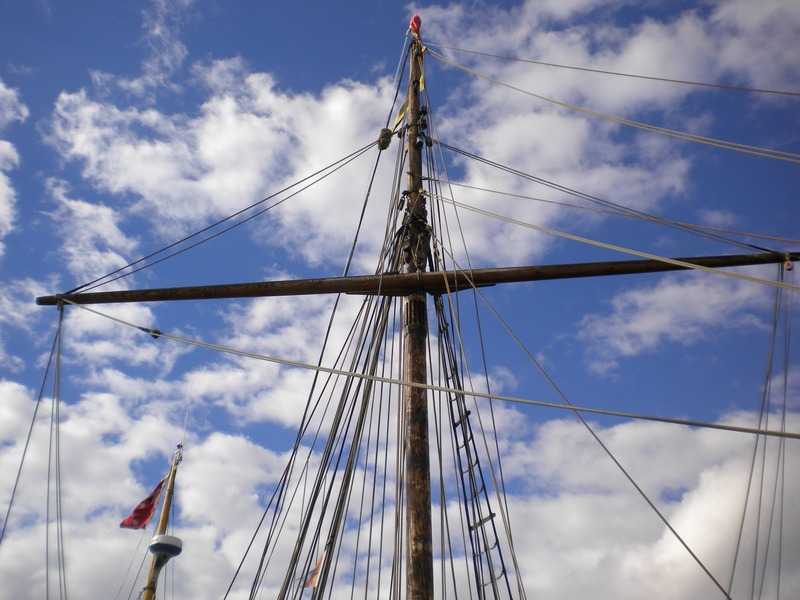 ‘Terra Linna’ with topsail aloft was an inspiring sight. Returning to the launch ramp through the moorings we discovered ‘Terra Linna’ plus crew and came alongside for a chat. Knowing the significance of the vessel to which ‘Touch Wood ‘had brought us provided a very special moment in her voyage log. 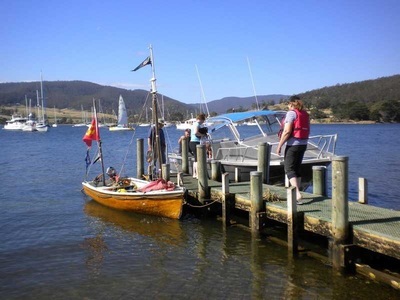 Back at the boat ramp for recovery time, the afternoon was completed by the arrival of ‘Yukon’ at the public jetty. ‘Yukon’ is a very important small tall ship for our Tasmanian fleet, particularly because she is square rigged on the main mast! A group sailing day on ‘Yukon’ will be an adventure in itself. The shortened visit to Cygnet was still most worthwhile and helped to further strengthen our knowledge and networking. The WBGT has a future focus on the River Derwent at New Norfolk which we will be investigating, and further contact with Franklin, ‘Yukon’ and the Living Boat Trust is another vital aspect of our programme. Meanwhile on Spring Bay familiarisation training cruises for our members will make up for opportunities lost at Lymington. Kettering Voyage Report What a Blast! 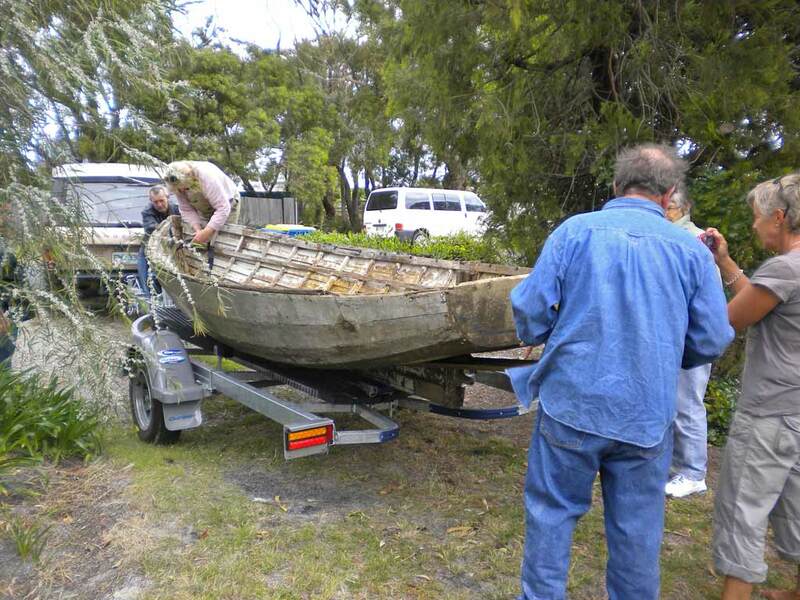 Preparations for the first Small Boat Venture by The Boat Shed included the statement. Following on from a very successful and enjoyable joining with the WBGT at Prince of Wales Bay and Little Swanport expectations were very high as our Kettering Venture was to be part of a Guild and Kettering Yacht Club joint event. Refining the planning according to conditions, especially the weather, was always part of the process. Our entry was received for Kettering Wooden Boat Rally 3. 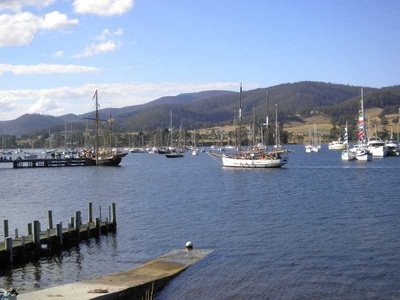 A change in start location was made to reduce the voyage’s early stage by launching at Geilston Bay and being further down the Derwent sooner rather than later in the morning. The plan always was to arrive at the gathering mid afternoon and depart the festivities in the early evening. Keeping a close watch on long-term forecasts introduced the first concern about a very nasty forecast for our special Sunday Preparations through the lead-up week included a trial sail on Spring Bay. Crew member Christine settled in on the bow thwart with only a few headaches, but that is another story! Bay for launching. A very peaceful and scenic 40 minute motor cruise to Kangaroo Bay and a return to the trailer was followed by a road trip to Kingston Beach for boat ramp access survey, then to Tinderbox where a decision would be made about what was possible next…always with an eye on the weather and the threat of that forecast which was for an intense westerly change and gales around midday. Arriving at Tinderbox midmorning after a great start to the day the westerly sky was grey but not threatening and boats were on the water with a weak southerly coming up the Channel. With Kettering almost in sight a decision was made to relaunch and complete the voyage. An hour motoring to Oyster Cove took up the safety limit range for the outboard fuel tank so our first on-water refuelling took place on an empty mooring off Oyster Cove. Another 30 mins found us alongside at Kettering in the gulch in front of the marina and the Kettering Yacht Club. A happy arrival after total motoring voyage time of 2 hours and 15 minutes. A warm welcome from the Guild members present and our own support crew was followed by a traditional ‘Sit About and Chat’ and barbecue . Thanks and congratulations to Graeme and Ainsley, masters of the sausage sizzle! 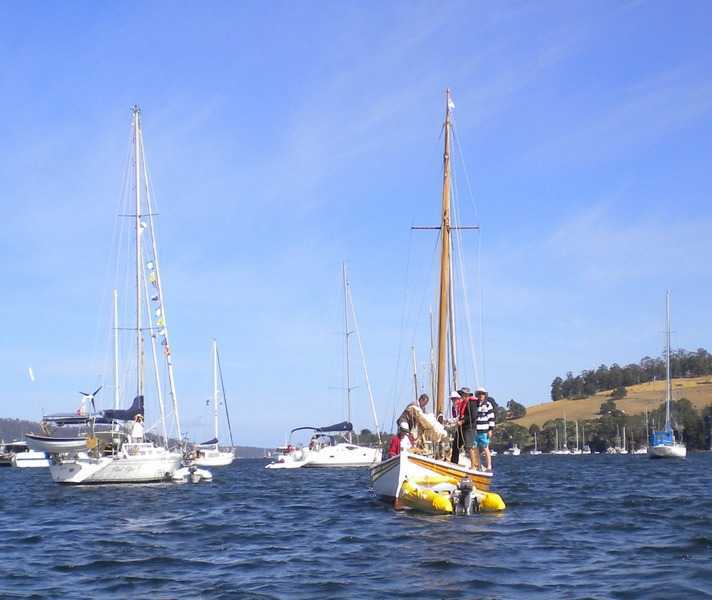 About 2 pm the desire to at least raise our square sail at the event proved too much and we motored out of the gulch and hoisted sail just beyond the ferry ramp. 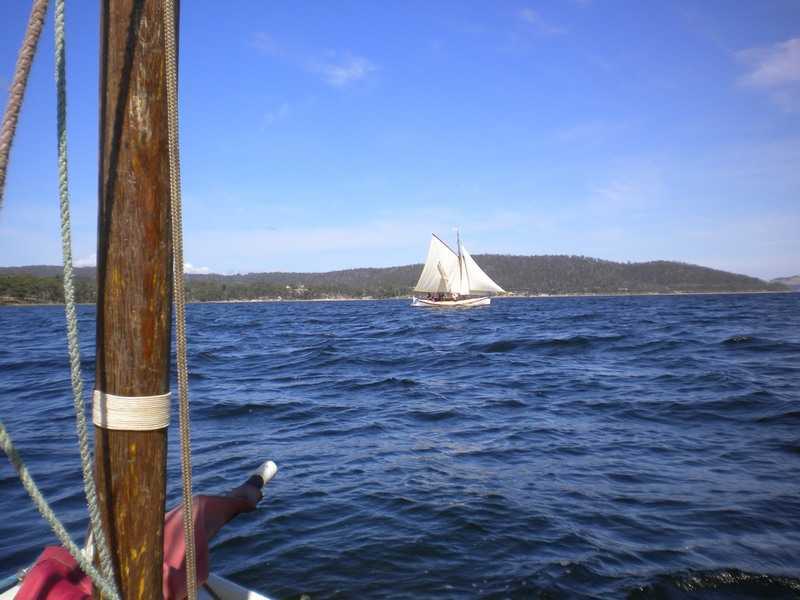 A limp sail with no wind and still no threat from the weather brought the decision to return to our haven alongside….upon striking sail and coming about the first hint of dark, wind-ruffled water approaching us on the bow was immediately followed by a tremendous clap of thunder over towards Oyster Cove and then everything went white! Not being able to see because of heavy lashings of spindrift across an immediately violent water surface concentrated the mind quite quickly, thus without time to think, just to hang on and get soaked by the accompanying heavy rain, keeping ‘Touchwood’ head to wind into the gale and holding station became a very serious priority. Our earlier refuel allowed us to outlast the tremendous squall which came so suddenly with the change and the wonderful tiny outboard made way even against such a gale. I am tremendously grateful to the AWBF for those wide brimmed hats we were given as volunteers because holding the brim out straight to form a verandah while being drenched and buffeted was the only way that I could see at all to navigate through the marina moorings with the wildly swinging moored yachts. Eventually, after a very intense and certainly exhilarating voyage we reached a space alongside at the marina across from the yacht club. Returning ‘Touchwood’ to the trailer became an adventure in itself as the wind and rain continued and the carnage and turmoil around us became more obvious. Making sure all our Shed crew were safe took quite a while but we were ultimately all confirmed safe and sound. 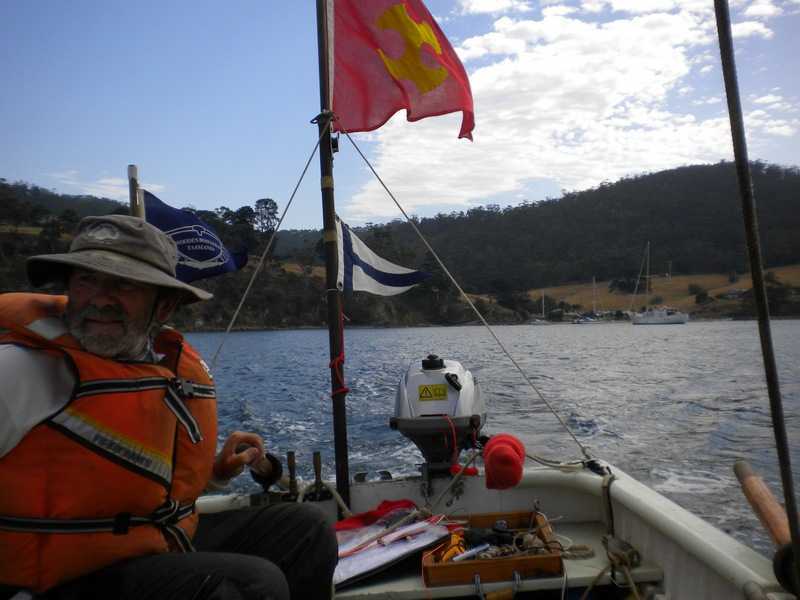 Many thanks to Graeme for being there on station at the yacht club during our trying time….and for finding my coveted and now treasured event flag and huon pine plaque! The return trip home via Sandfly due to a road closure with so much debris on the roadway proved the severity and significance of this amazing weather event which was indeed so destructive and sadly, deadly. As a result of our experiences at Kettering Rally 3 ‘Touchwood’ is now the “work boat” on our trailer and the ‘out the front’ Shed advertisement with a real story of her own to tell. Our Australian Mens Sheds Association funded boat trailer was on its first serious outing. It worked magnificently and was an extremely necessary part of the operation when reliable performance under stress was the most valuable asset. Many thanks to Christine and Wayne for so much immediate support. Many thanks to Garry and Therese who were there early and along the way. Pat, Noel and Di shared our time at Kettering , and to Byron who got as far as Sandfly. 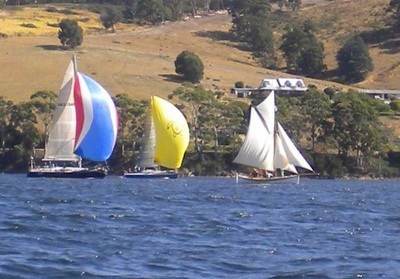 Thanks to our Wooden Boat Guild of Tasmania friends and of course the members of Kettering Yacht Club for providing such a memorable event. 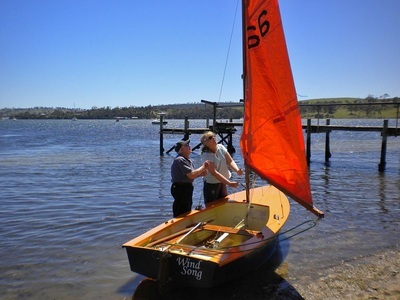 Our Outreach programme at The Boat Shed is alive and well and on the water…our next event in process is the Cygnet Regatta in March. Another venture to anticipate. Graeme said” Everybody was told about the weather! !” Thanks mate. Welcome to The Boat Shed for the first time in 2014….indeed, may we all have a Happy New Year. Getting under way after a break and looking forward to events coming up is all a part of starting the new year. Monday meetings were continued through ‘The Holidays’ with members combining their projects with working around busy Christmas programmes. Restoration work on ‘Teba’ has progressed to the deck framing stage after a move into the main shed and hull cleaning has begun on the St Helens boat in the green shed. We have been very fortunate to obtain the two hulls from Matthew Chester and his family late in 2013. Sadly the little dinghy has been declared a wreck, but she will be added to the static display on The Shed entrance apron. The January 17,18,19 weekend at Little Swanport was a networking combination with the WBGT at ‘Swannie’, Allister Martin’s property. This is an ideal venue for the acquisition and development of boating skills by our Shed members which we will commencing in the near future. Many thanks to the Guild, Allister , Peter and Fiona for a great weekend and wonderful hospitality. Annie Taylor site visits and Wreck Room improvements are a combined work in progress. Very low tides late in January have allowed us to photograph the remains of the wreck on the beach at Rheban .This will enable us to create an information panel on the ‘Annie Taylor’ with our collected material already on display and other information from the Port Albert Maritime Museum. 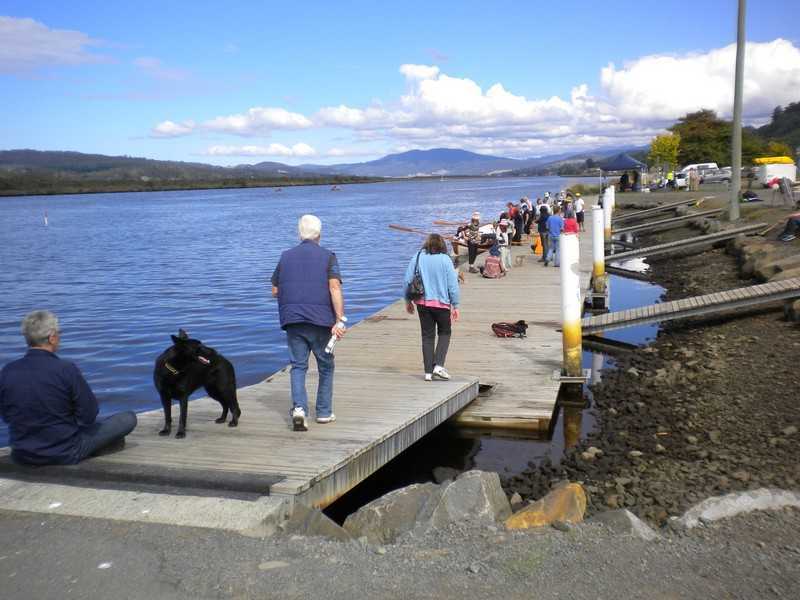 Visitor response to the Boat Shed over the Summer has been very favourable . Our last visitors were from the Living Boat Trust at Franklin and the crew of a yacht from Victoria. 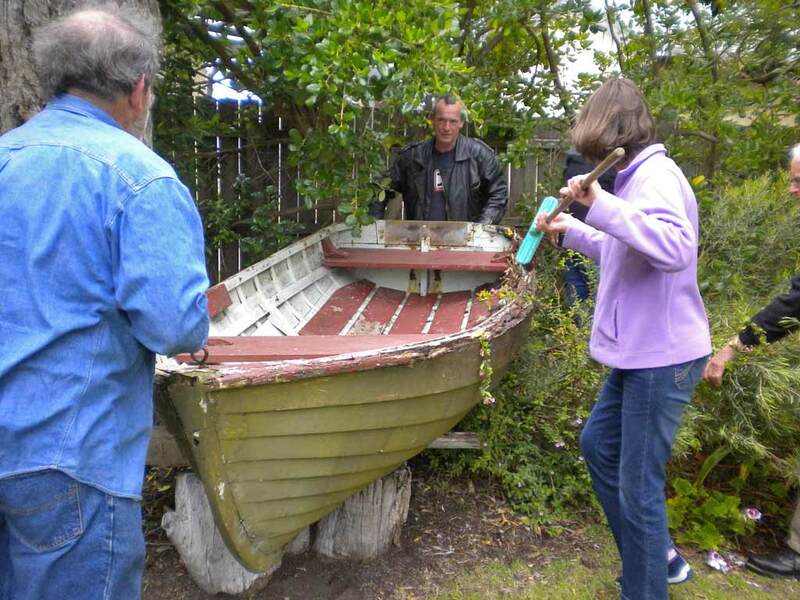 Maritime enthusiasts are very interested in The Shed, its activities and what it represents as a working custodial wooden boat facility. Every visit increases our profile as we offer short, medium and unlimited time explanatory tours. Through encouraging feedback we are building an ever widening network of very supportive contacts. 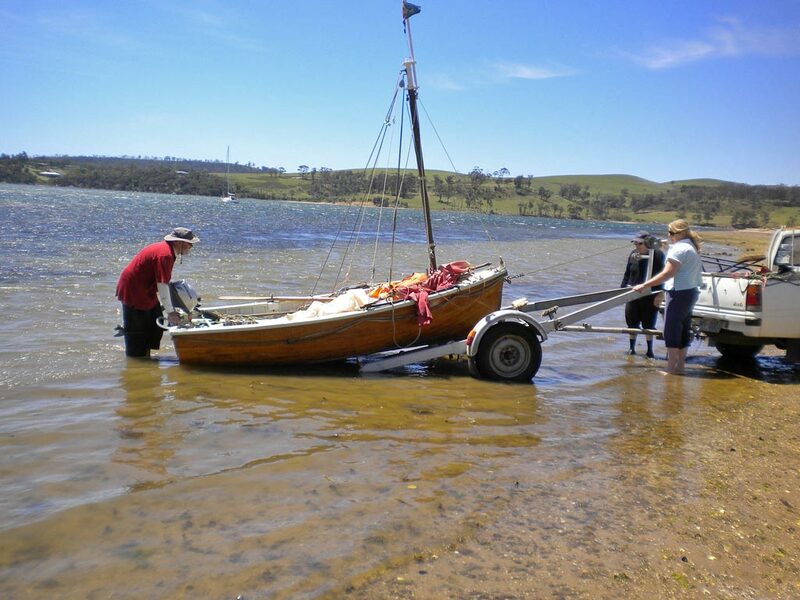 Preparations are well in hand for our Shed team to participate in the Kettering Wooden Boat Rally 3.Our entry has been received and ‘Touch wood’ will be voyaging from Geilston Bay to Kettering on Sunday the 9th of February. An early start will see us arrive at the gathering mid afternoon and depart the festivities for home, with the boat on our trailer, in the early evening. This voyage is planned to explore the possibilities of regular on- water outings as significant opportunities for our Shed crew to enjoy. 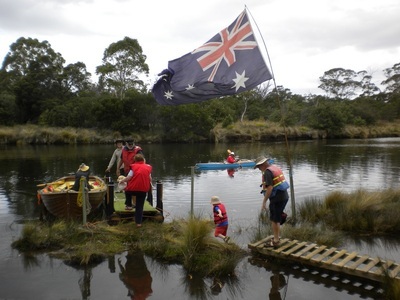 Ultimately, we are now twelve months away from the Australian Wooden Boat Festival 2015 and planning is under way to take part in that event. It’s December and Christmas is almost upon us with The Shed winding down slightly after a very active year. Our Outreach Programme into the community through the Village Market link culminated with the drawing of our Christmas Raffle fundraiser on the 15th of December. 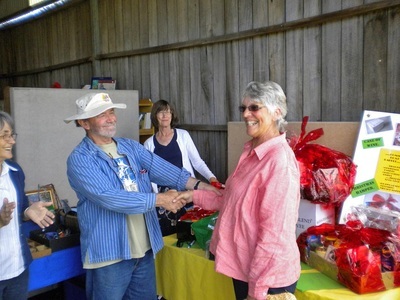 Thanks to generous donors and Shed members we were able to offer six attractive prizes. The lucky winners have all received their rewards. Special thanks to May Pyke for volunteering to sell tickets for us on three occasions. Very recently we have joined with the Triabunna Tourist Information Centre to offer visitors a new and interesting experience while spending time in Spring Bay. 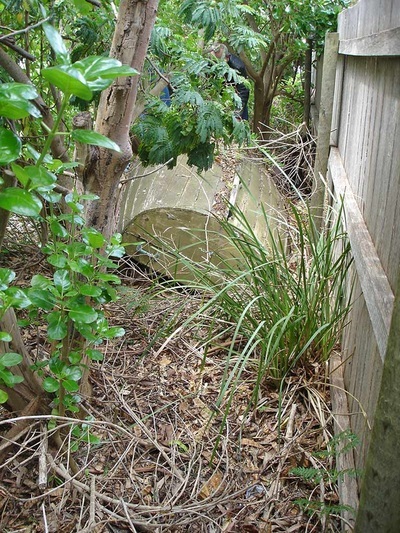 This has resulted in very positive comments from groups who have enjoyed investigating what our Shed has to offer. ‘Teba’, our current restoration project, has been joined by two boats transported from St Helens on our AMSA trailer following a very generous donation. It was a great exercise for our recovery team and all went according to plan. Our trailer grant has now been acquitted much to the delight of AMSA and our members. Although a long process we can now settle to planning many further Outreach activities based around our trailer. 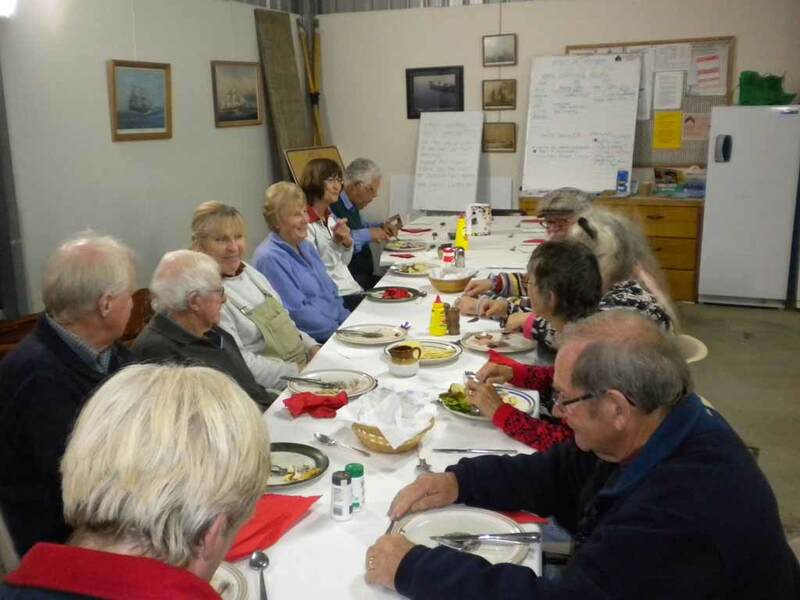 Our on-water adventures at the Christmas Picnic at One Tree Point on the 24th of November were washed out, but a wonderful luncheon was enjoyed by members who gathered in the relative warmth and dryness of the Shed on the day. 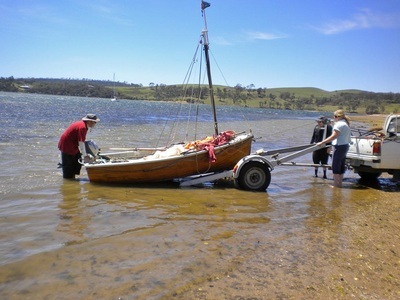 Subsequently we have conducted an on-beach dinghy launch and recovery exercise at One Tree point with many more to come. 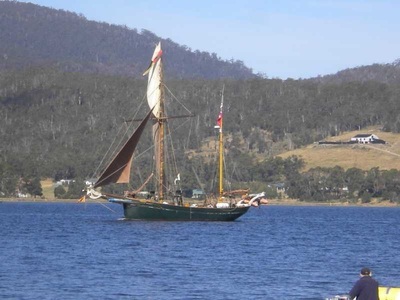 We have also attended a Wooden Boat Guild celebration day at Prince of Wales Bay for the restored historic yacht ‘Terra Linna’ and we are planning a combined weekend with The Guild in January at Little Swanport. The Shed Voyage to Kettering Venture which will see the heavy dinghy ‘Touchwood’ motor-sail from Bridgewater to Kettering for the 3rd Kettering Wooden Boat Rally in February will be part of our future in 2014. Thanks to all those who have helped to make 2013 a success for The Shed and happy Festive Season to all. It is unusual for one piece of news to fill up this newsletter. However in this instance an exception can be made. This event described in this report happened on Wednesday 27th of November and involved a road journey from Orford to St Helens and return. 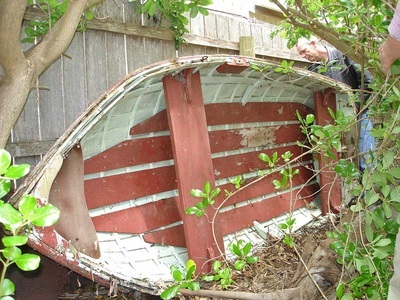 Upon receiving information from Graeme Hunt, leading up to the great day were several weeks of e-mails and phone calls which resulted in the offer of a wooden boat hull as a donation to the SBCBS if The Shed was interested in its restoration potential. In the phone call to confirm our journey we were advised of a dinghy hull on site which could have possibilities as well. The photo sequence shows the progress made and results achieved…and only a couple of spiders damaged in the process!!! 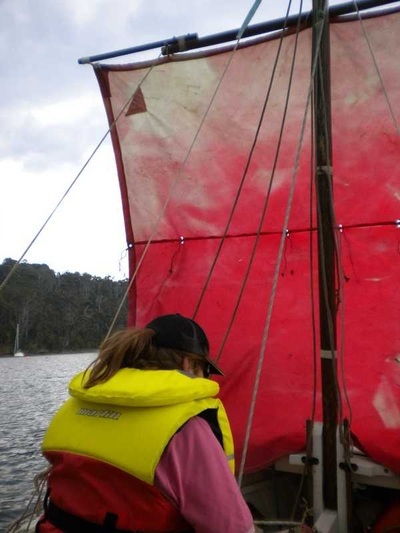 This amazing outcome has been achieved by the strength of the wooden boat community network of which we are very proud participants. 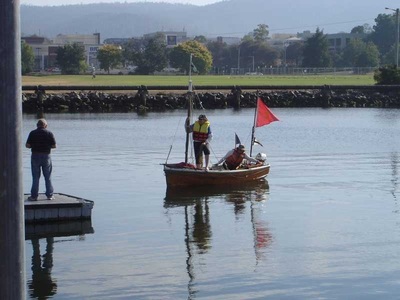 Thanks to the Wooden Boat Guild of Tasmania for the starter information. Thanks to our intrepid crew we now have two ‘new’ project vessels in The Shed. Very special thanks to Matthew and his family for their wonderful donations and being the cause of a great ‘cruise in company’ to St Helens. The Spring Bay Community Boat Shed Snapshot 3. November continues to be exciting and a time of great activity in the Shed. We have continued our Outreach Programme into the community through the Village Market link. 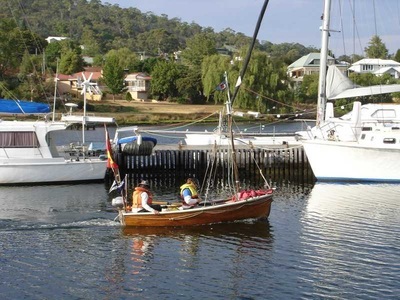 Very recently we have joined with the Triabunna Tourist Information Centre to offer visitors a new and interesting experience while spending time in Spring Bay. This has resulted in very positive comments from groups who have enjoyed investigating what our Shed has to offer. Shed catering is creating a growing reputation with twenty people being fed on our Pizza Monday thanks to Christine for all her creative pizza expertise. Similarly, our washed out Picnic Day became a festive feast very much enjoyed by all those hardy souls who attended. Once again a huge thanks to our ladies, and all who brought very welcome contributions and not forgetting Noel for his serious trifle! 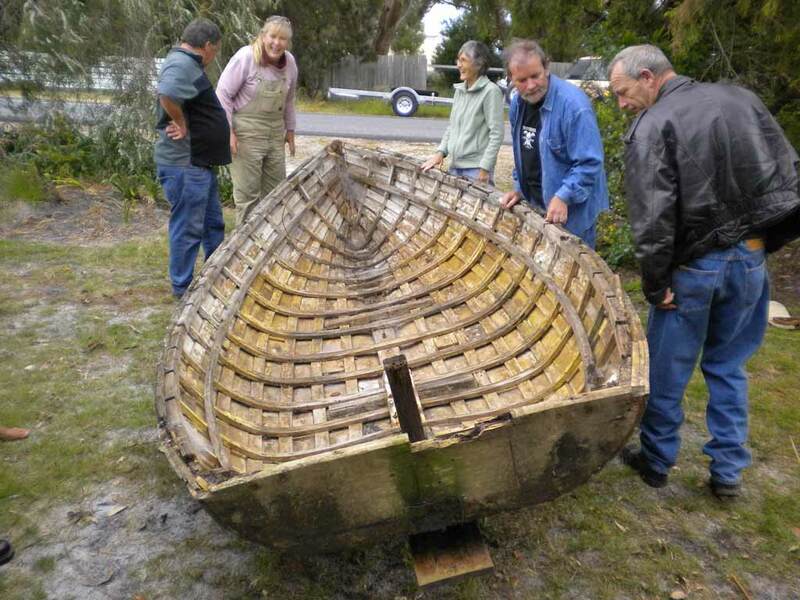 The restoration of ‘Teba’ proceeds with hull painting soon to begin. 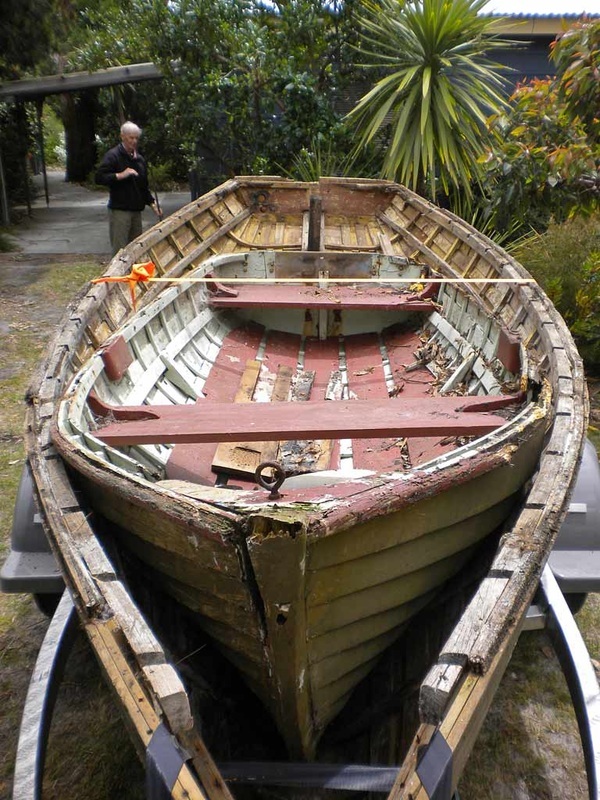 Watch this space for the next exciting instalment of our restoration programme which will reveal details of another donated boat coming our way!!!!!! 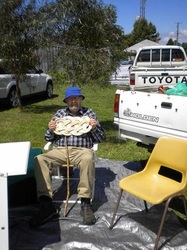 Ropes and knots master, Peter Jones inspired patrons with his rope mat making expertise at the November Village Market. 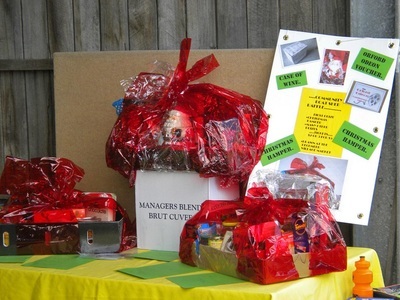 Our Christmas Raffle launch was very successful. Tickets will be sold until the market on the 15th of December when prizes will be drawn. Special thanks to May Pyke for volunteering to sell tickets for us on Friday in Triabunna. May will be at the Triabunna IGA in early December for more ticket selling. Our on-water adventures at the Christmas Picnic at One Tree Point on the 24th of November were washed out, but a wonderful luncheon was enjoyed by members who gathered in the relative warmth and dryness of the Shed on the day. 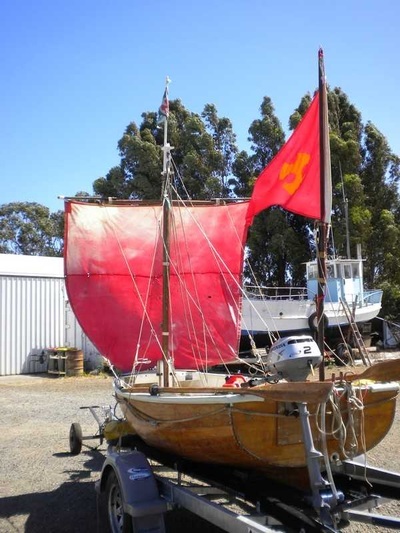 The Shed Voyage to Kettering Venture which will see the heavy dinghy ‘Touchwood’ motor-sail to the 3rd Kettering Wooden Boat Rally in February 2014 will be launched in December. November has come upon us with the promise of Christmas approaching. The Shed supported a model boat-making workshop for men and boys at the Village on Sunday the 3rd of November, also providing a pizza feast for an enthusiastic group of participants. The following day two groups of touring motorcyclists enjoyed a Shed tour as part of their Spring Bay visit. Three South Africans and two Victorians were immensely impressed with the achievements of our members. Archeologically our restoration of ‘Teba’ has turned up some surprises. Along with a concrete centre-case plug came a collection of horseshoes to add strength to the mix. These will feature in a display of interesting and meaningful artefacts soon to appear in the Shed. 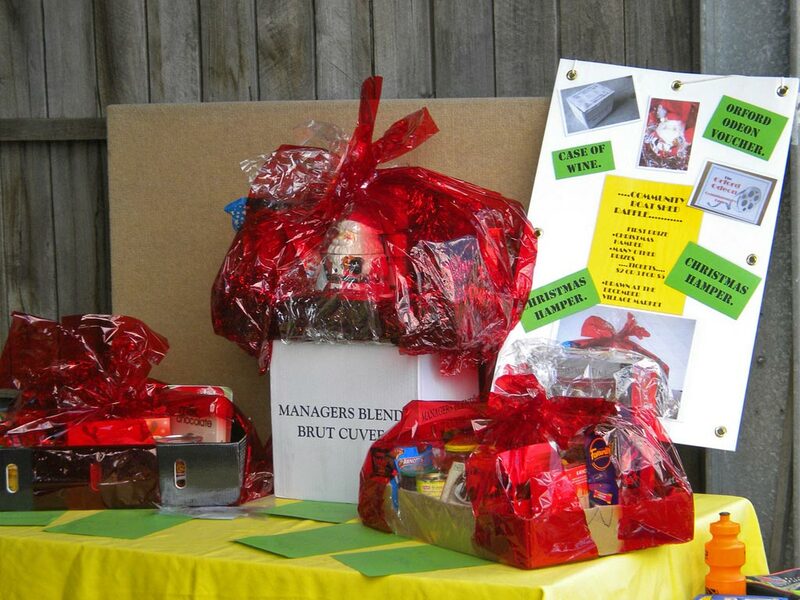 The Village Market on the 17th of November will see us launch our Christmas Raffle with five special prizes. Tickets will be sold until the market on the 15th of December when prizes will be drawn. At our Christmas Picnic at One Tree Point on the 24th of November we will launch our Voyage to Kettering Venture which will see the heavy dinghy ‘Touchwood’ motor-sail to Kettering to join in the 3rd Kettering Wooden Boat Rally which will be held in February 2014. The picnic will be for members and their families to enjoy another on-water day following in the tradition of our first event for Stan Clements’ launch of ‘Windsong’ in June. The Shed has been busy over what is deemed to be the ‘off season’ during Winter. A decision to widen our profile has seen progress in two directions. Firstly, we have produced an introductory brochure and business card and are taking steps to improve the experience available to visitors by producing explanatory signage in the workshop building. Secondly, our Outreach Programme has taken groups of members into the wider community. The Shed has displayed our little boats at the Triabunna Village Market and strengthened links with Eastcoast Regional Development Organisation and the Orford Triabunna Chamber of Commerce. Two visits to the Tall Ships Hobart event were most enjoyable. We saw ships alongside in Hobart and under sail on departure at South Arm. 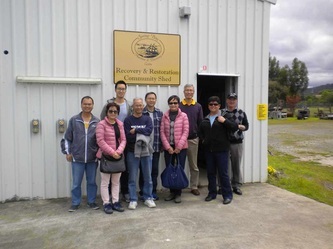 Our wonderful voyage to Maria Island in August, thanks to Mike Davis and the free cruise time inspired a road trip to the Living Boat Trust at Franklin in late October. Their Bosun’s Locker Sale and great hospitality made for another very memorable Shed experience. Many thanks to Ros, Richard and the LBT crew. Sister boat shed status provides an enormous range of possibilities for us.